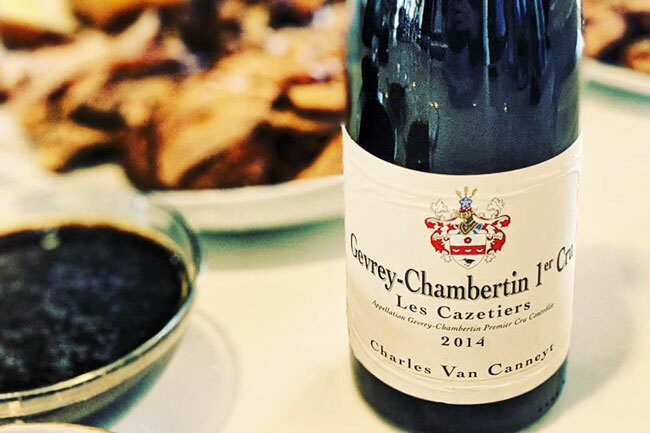 We opened a bottle of Charles Van Canneyt Gevrey-Chambertin Cazetiers 1er Cru 2014 over lunch recently to entertain an overseas guest. He was an established French individual in the wine trade, and we thought it could be interesting to enjoy a bottle from Charles van Canneyt. Charles is the grandson of Alain Noellat, the current winemaker of Hudelot-Noellat. With the land prices of Burgundy going sky high in recent years, he joined the group of talented young winemaker like Benjamin Leroux to produce his own range of Burgundy wines through long term contracts. His success in elevating the quality of Hudellot Noellat’s Romanee St Vivant is very evident in his own selection of wines. The Gevrey Cazetiers showed beautiful firm tannins, with lovely black fruits aromas and flavors. Very good cellaring potential. His selection is the testament that we can enjoy top quality Burgundy wines at fantastic prices today. We are pleased to highlight the range of Charles Van Canneyt we have available for immediate delivery.